On a dazzling green and blue Sunday morning in Swarthmore Ville, the town hummed with anticipation. Wood pigeons warbled, squirrels screeched, chipmunks chirruped, and rabbits romped. More hungry humans than usual peeked into Vicky’s Place and Hobbs’ Café, seeking breakfast. Something was afoot. 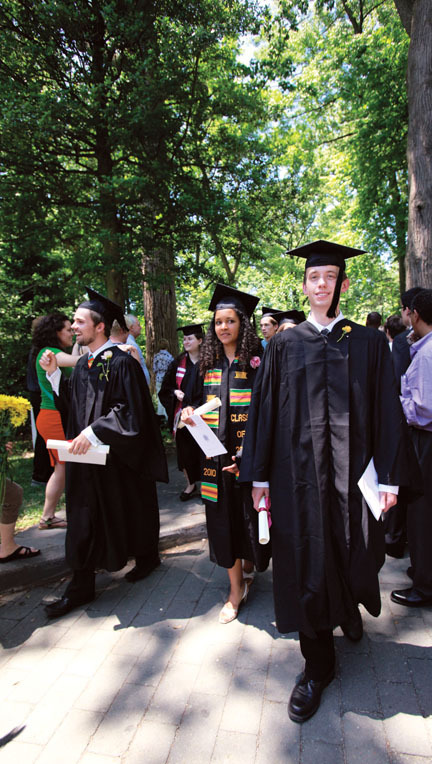 Not just any Sunday, this was the day of Swarthmore College’s 138th Commencement, when 354 young people would leave the safe haven of the campus and launch themselves upon the world. On Fieldhouse Lane, at the foot of the campus, staff members in smart Garnet garb directed family members in festive dresses and suits—including some stunning, colorful traditional costumes of African and Asian countries—to parking spots. Eager drivers transported guests in golf carts, bustling with antlike efficiency up the hill to drop their passengers at the Scott Amphitheater. By 8:30, seats were filling fast for the 10 a.m. ceremony. 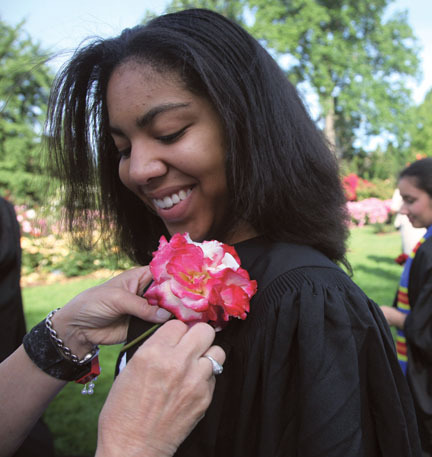 Graduate-to-be Marsha-Gail Davis smiles her approval, as helpful hands assist in fastening her rose. Seniors drifted around in gowns that concealed all manner of dress, from formal to casual to even bare-chested, matching high heels, flats, sandals, flip-flops, and even bare feet. 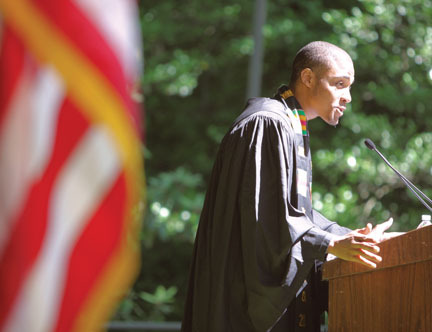 On the path below Wharton Hall, one young man—already dressed for the ceremony and with brown breakfast bag in hand—stood alone, gazing contemplatively down toward the tennis courts. 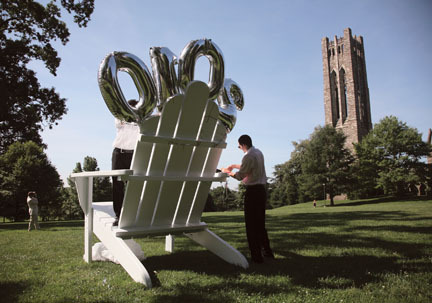 Others sat in groups, some laughing and chatting; some looking a little dazed, as if in a kind of limbo, knowing that this was it—their final hours as Swarthmore undergrads. Although a couple couldn’t remember where they’d left their caps, none forgot to stop by the Dean Bond Rose Garden—an explosion of fragrance and color that had been carefully induced by the Arboretum gardeners to look just this way at just this time. Meandering among the clustering blossoms, each senior selected a perfect rose. One young woman, having closely examined countless options, stopped beside a bush of dense, dark-salmon-colored blooms. “I absolutely have to have that one,” she said, pointing to a particularly lovely rose. An Arboretum assistant, holding clippers aloft, scurried to help, deftly snipping the chosen rose and then helping the young lady attach it to her gown. Family members stood around, aiding, advising, snapping photographs. By 10, all who had misplaced their hats had recovered them and taken their positions in the procession on Parrish Walk. Parade Marshall Don Shimamoto led the way, followed by President Rebecca Chopp and Chair of the Board of Managers Barbara Mather ’65, honorary degree recipients, the faculty, and the soon-to-be graduates. To Associate Professor of Music John Alston’s arrangement of “Swing Low, Sweet Chariot,” they wound their jubilant way, gowns swaying, to an amphitheater so full that seats were shared and hundreds stood. In the place that President Chopp in her speech so aptly described as “this theater of earthly beauty,” surrounded on all sides by blooming mountain laurels and rhododendrons, Mather asked for a moment of silence before welcoming guests. Martha Spanninger ’76 read an excerpt from Johann Wolfgang von Goethe’s Faust, and elected student speaker Romane Paul provided both humor and food for thought as he described life in “Swaviland.” Chopp charged the students to cultivate wonder, apply critical thinking, and use their imaginations. 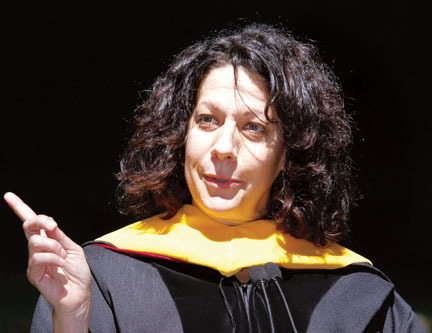 She awarded honorary degrees to Bonnie Bassler, Squibb Professor of Molecular Biology at Princeton University; John Braxton ’70, a long-time Quaker activist and labor reformer; Robert Michael Franklin Jr., president of Morehouse College; and Stephen Lang ’73, an award-winning actor in plays, films, and television. The graduating class selected Romane Paul as their speaker. 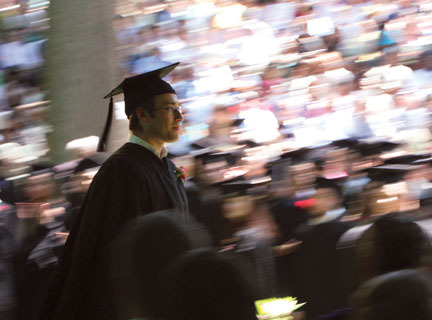 Before conferring bachelor’s degrees on members of the Class of 2010, Chopp requested they turn to applaud their parents for a job well done. Then, for an hour or so, the amphitheater rang with cheers and clapping from proud parents and supportive friends. 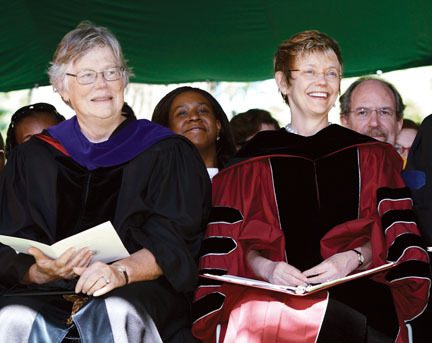 Swarthmore links were strengthened and lengthened, as, toward the end of the degree ceremony, Elizabeth Nicholas Wesson and Margaret Blum Weston—sitting next to each other near the end of the alphabetically ordered line of seniors—stood to receive their degrees. Among their respective cheering squads were their fathers Joel Wesson ’82 and Beau Weston ’82, who, 28 years earlier, had sat side by side as their daughters did now. They later married ’81ers Lisa Nicholas and Susan Perkins. What’s more, the grandparents of the two girls—David and Anita Dabrohua Wesson and William and Jean Sherry Weston—were all members of the Class of 1951, although William Weston actually graduated with the Class of ’52. “It will be interesting to see what happens to our girls,” Beau Weston said. Caps were thrown high. Final cheers rose higher. 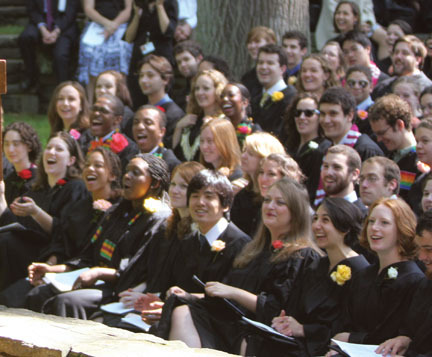 Then, to Alston’s arrangements of “Dancing in the Street” by William Stevenson and Marvin Gaye and “Love Train” by Kenny Gamble and Leon Huff, the Class of 2010 danced on out of the amphitheater, away from the campus, and off into the street. Barbara Mather ’65, chair of the Board of Managers, (left), accompanied President Rebecca Chopp at Chopp’s first Commencement. 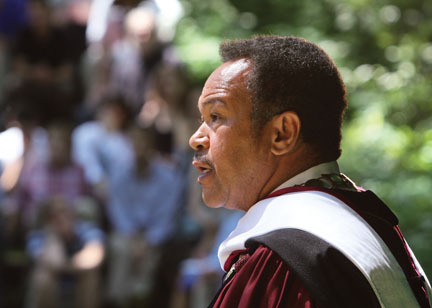 Honorary degree recipient John Braxton ’70, activist. 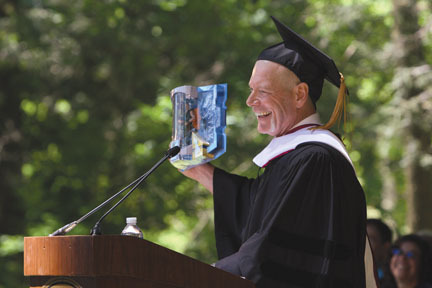 Honorary degree recipient Stephen Lang ’73, actor. 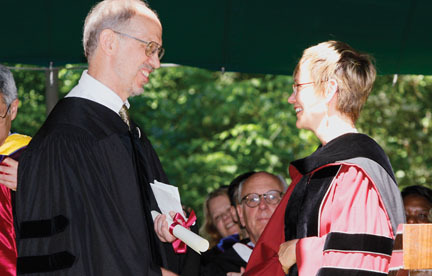 a href="http://www.swarthmore.edu/x26803.xml">Watch: Remarks of Honorary Degree Recipients, President Rebecca Chopp, other Commencement, as well as Last Collection, and Baccalaureate speakers.